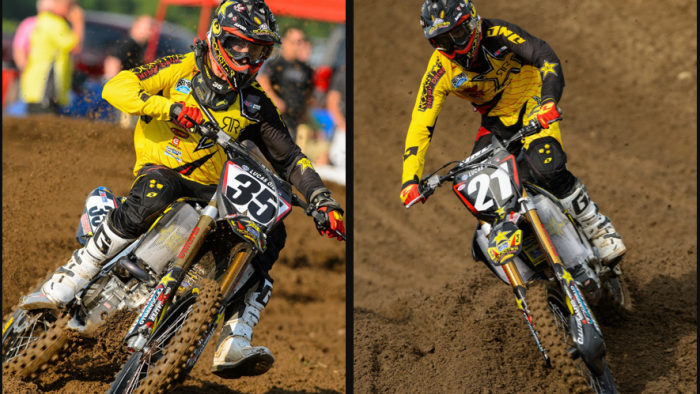 Rockstar Energy Racing ran into some misfortune as the series headed to Round 7 of the Outdoor MX National series at Redbud. The Michigan track is known for having the most enthusiastic fans and being one of the most highly attended stops and it lived up to that reputation. The race always takes place over the 4th of July holiday which just adds to the excitement in the huge crowd. However the team didn't have a lot to celebrate after being hampered by adversity. Ryan Sipes definitely has the speed to run in the top five and that has been proven. That is not the problem. He just hasn't had two consecutive motos go his way in a few weeks. In moto one, he had a decent start but had an issue early in the race. As Ryan Villopoto paused in a corner unexpectedly, Ryan ran into the back of him stalling his bike. When something like that happens early in a race, you immediately find yourself at the very back of the pack. Sipes put on one heck of a charge to climb all the way back near the top 10 by the final lap of the moto. In the second moto he struggled near the end. He just needs to have a good day and get his confidence back up. Ryan Sipes: "It was a bad weekend, well not awful. I'm healthy and everything. I'm just kind of struggling a little bit. I don't know, I need to get my ducks in a row. I don't wanna ride around in the back so I'm looking forward to Washougal." Jason started out the day in excellent form. He qualified with a best ever second overall fastest lap time in practice. In the first moto he was flying. As he was making his way towards the front. Something weird happened and then got even more strange. He came into contact with Justin Bogle and his foot peg went into Jason's front wheel snapping several spokes in the process. Then one of the oddest things ever seen took place. One of Anderson's front spokes actually went into his back wheel, tearing into the sidewall of his tire. By the time he made it the mechanic's area both his wheel's were barely rolling. The team's mechanics then had to replace both of his wheels before he could get back in the race. By the time he got out there and crossed the finish line, the result was 34th. This was going to make the next moto tough as well with a very poor gate pick. Jason had a good jump out of the gate but had nowhere to go coming from way outside. With a good gate he would surely have been in the top 5. As he got pinched off he was shuffled all the way back outside of the top 15. He charged through the toughest 250 class field in recent memory all the way up to 6th. A very good way to end a tough day. Jason should be happy with his effort. Jason Anderson: "My day was pretty good, well kind of good. I ended up like 34-6 but the 34th I was riding really good. I just had bad luck and the 6th I had a bad gate pick and was just working through the pack the whole time. So I ended up alright." Blake Wharton also received some bad news. Blake was diagnosed with a virus the week prior to the Redbud National. Wharton's illness is something that's curable but the team can not confirm when he will be able to return. Rockstar Energy Racing will now have a week off to recollect themselves and look forward to a better day in Washougal, Washington. Ryan Sipes will benefit from the time off and work to figure out how to return to his early season form. Jason is doing everything right and with a little luck on his side, should be able to find the podium in the next round. RedBud MX - Buchanan, Mich.